Here is an example of of a closet we got called into with water damage. Unfortunately, due to the many storms we've been having more than one closet was ruined in various apartments. The complex thought it would be a good idea to call us in after the facilities team tried cleaning them themselves countless times. In hopes to save themselves time--we were told that we were the first company they thought of since we have done some water and mold remediation and damage in past. The job took about a total of three days to air everything and complete the job in full. Luckily, there was no mold damage this time so our team got the job done very quickly without disturbing all of the residents too much. Here is an example we got called into tend to recently. A nearby diner we are acquainted with had a fire in their back room damaging much of their ceiling. Typically, fire damage is tougher and takes longer to restore. The owner and manager of this diner we very worried about the amount of time it would take to fix everything. For a job we initially anticipated to take about a week, as a team we ended up completing in three days time. Our client was very impressed and was overjoyed that they could re open their facility sooner than they thought. Here at SERVPRO we're not only efficient with our work we our courteous of your business' time. We understand the importance of being open for service as much as possible and are always here to help if a problem arises! I'm sure when SERVPRO comes to mind for most people they think of our main services: Fire, Water, and Mold Restoration, being that they are some of our "bigger" jobs and services we get called into. That being said, we also tend to residential and commercial carpet and vent cleaning as well. 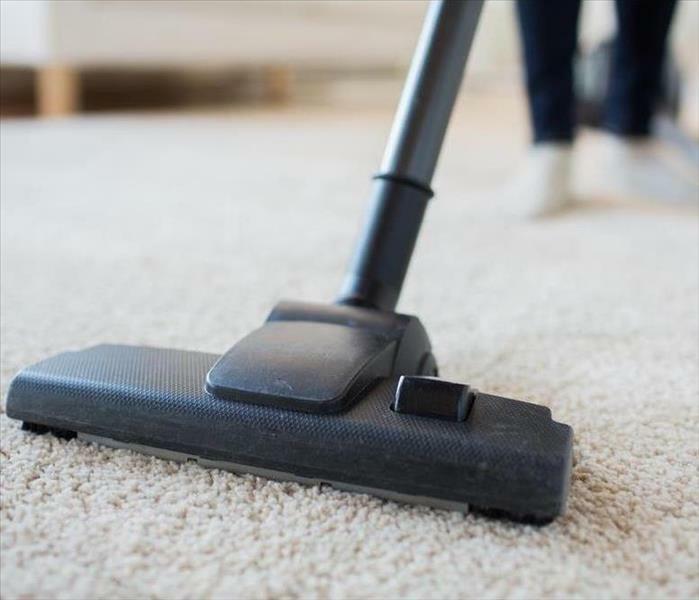 We tend to focus heavily on apartment complexes when it comes to carpet and vent cleaning, being that the need to clean the units is more frequent. However, we also have serviced residential single homes who need their homes cleaned, too. As far as commercial goes, hiring a service to come and clean for you is a great idea! Many restaurants we service have told us repeatedly how thankful they are that we've stepped in, when needed, so they can focus on more important aspects of the business. We had a call here at SERVPRO this week for water damage in a clients' basement over the weekend. The upstairs toilet leaked and unfortunately leaked through the entire floor. If it wasn't enough as it was that our clients' furniture was damaged, his basement floor and walls had sever water damage as well. He knew he wouldn't be able to take care of the issue himself, so he decided to call us right away. Our client didn't think twice about calling us since he had used our services before when he had a fire in his kitchen upstairs. He knew we'd be a reliable source and get the job done efficiently. He said he will be referring us out to family and friends in the future if another problem arises. A nearby Friendly's gave us a call recently about a pipe burst in their restaurant. When the pipe burst it destroyed the entire carpet and even some of the seating in the building. Being a larger establishment, the owner found it in their best interest to give us a call. They mentioned they have used SERVPRO in the past at one of their other locations, and said they wouldn't trust anyone but us to get the job done. In total, the work took about 3 days to complete. Everyone was very happy, thinking the job was going to take much longer due to the amount of damage. If and when a problem arises, please don't hesitate to give SERVPRO a call--we're here to help! Here is an example of a call we received about water damage done at triplex building. There was a water leak on the third floor, which ended up seeping down and affecting the two units below it as well. The pictures shown here are on the ground floor. The water went through the living room, kitchen, and hallway. Due to this affecting so many properties, it was clear to the landlord that he needed to call SERVPRO right away. He mentioned when he spoke with us, he was overwhelmed with what had happened and was very happy he decided to call our office. The help allowed him to put his mind at ease and know that the damage would be fixed very quickly and efficiently. Here is an example of a customer we had that had water damage to their new hard wood floors. Our client was very worried about ruining the floors they just put in, so they called us here at SERVPRO Langhorne/Bensalem to help with their trouble. Having seen this time and time again on hardwood floors with severe water damage, we were able to approach the situation appropriately and salvage the new floors. Why SERVPRO you ask? We have been recognized for our delicacy and tactics to save certain types of flooring as opposed to our competition. Or, many times--clients assume it is a better idea just to take care of the issue themselves. While this may work some of the time, most of the time we get a call right after their attempt. With our gentle products and necessary tactics for clean up, we can assure you will be satisfied with the outcome of our work.